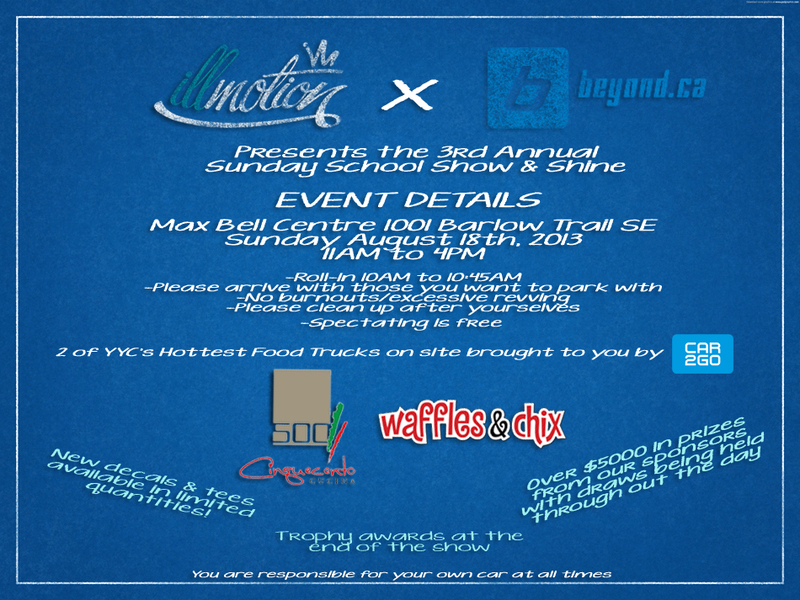 Only two more sleeps until the illmotion Sunday School Show & Shine this Sunday, August 18th at the Max Bell Centre! Hopefully everybody was able to register because I know they filled up super quick and I also know that there’s always those dudes that are like “bro, I follow you on Instagram – can you just squeeze me in?”. I know that can be frustrating for the guys because frankly, “bro”, they can’t squeeze you in if there are no parking stalls left to “squeeze” you in to. You wouldn’t want someone squeezing in 6 inches away from your car in the parking lot at the mall, and you wouldn’t want it at the show either. You snooze you lose. I apologize for the mini rant… The reason I brought it up is because I’m still seeing people ask if they can still sign up. I understand how stressful it is setting up a show with hundreds of cars, not to mention that there are other things like the food trucks, venue fees, and all the backstage planning for awards and getting in touch with all the shops/sponsors. The Sunday School show is probably one of the biggest that Calgary has ever put on for the import scene that doesn’t require a ridiculous entrance fee and rigged judging with legit sponsors and prizes. People with any type of car can come to the show – lightly to heavily modified – doesn’t matter. The one thing I’ve loved about this show is that people aren’t afraid of whether their car is qualified for it. Just bring your car and chill – that’s what it’s about. The other awesome aspect of it is that a big handful of cars you don’t see at big shows like Driven or at little meets show up for this. Lots of diversity and friendly competition. Come down, check out the cars if you aren’t showing and chill! See everyone there! The sponsors and the main ad. Rules for the day. Please follow them because nobody likes a douche canoe.